How their medical teams defined “undetectable” PSA levels. How their medical teams defined biochemical recurrence after a prostatectomy (what PSA level). At what PSA level did they and their medical teams decide to begin salvage therapy. 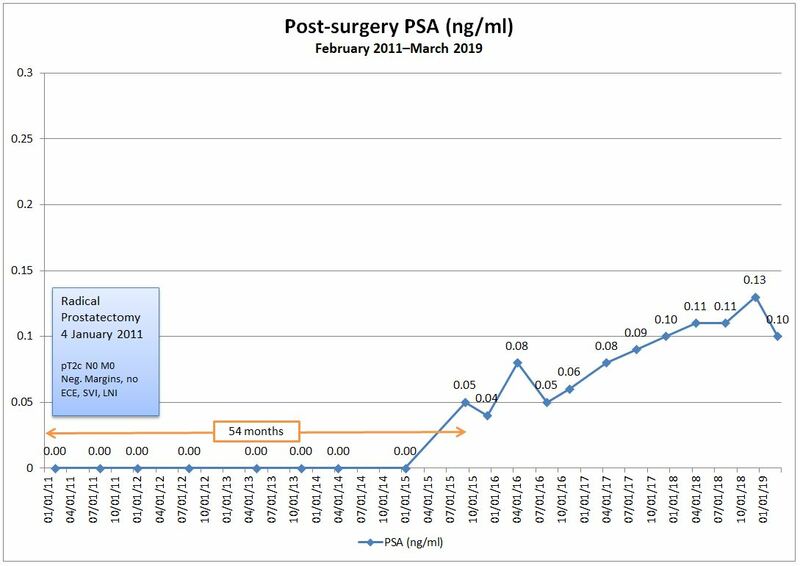 How long after PSA biochemical recurrence was it before salvage therapy began. The definition of “undetectable” generally ranged from <0.01 to <0.1 ng/ml. I believe that to be a reflection of whether the traditional PSA test or the ultra-sensitive PSA test is being used. The consensus for the definition of biochemical recurrence seemed to be 0.2 ng/ml. The PSA level at which some sort of salvage therapy began was widely spread between 0.17 ng/ml and 3.5 ng/ml. The time to begin salvage therapy after biochemical recurrence varied from one to 35 months. For me, there aren’t any real “A-ha!” findings that provide clarity, and I expected that going into this exercise. The only thing that’s clear is that each case is unique—from both the patient’s perspective and the medical team’s perspective—and that means that my numbers will be different from your numbers and those will be different from Sam’s numbers and all of us will act (or not) on those numbers differently. It is nice to know, however, that my medical team is in alignment with others on some of the measures. No wonder there’s confusion among us patients! Yes, it is up to us. For sure. I went in to this thing as a novice blindly following the advice of my urologist. I now use my medical team as advisers, do my own research, and make up my mind on treatment options. Maybe a control freak, but I wish I had a much more pragmatic approach in the early days. Although it is hard to think clearly in the midst of the cyclone that is cancer. Thanks for sharing, Phil. In those early days after diagnosis, none of us are all that clear-headed, and that’s not the best state to be in as we make life-altering decisions. Thanks Dan, it is very interesting when they talk about safe levels. The only time I was outside of the zone normally considered healthy was after a biopsy, which is apparently a normal response. I’m now in remission according to my oncologist, but my wife noted that he was slightly wrong in his observation that I went from 1.3 to 1.1 to 1.6, meaning that I was fluctuating, but when we got home we noted that over 6 months I had actually gone from 1.2 to 1.3 to 1.6 and therefore it is increasing. Either way, I am under 2 which is his marker for restarting treatment if needed. Meanwhile, I believe as a consequence of stopping the treatment, I have more energy and am not crashing at 6-7PM every night. Although I am still dealing with not producing cortisol and not having a chemical fight or flight reaction is really interesting when you are upside down in the water strapped into an ocean kayak and feeling bemused on roller coasters when everyone else is screaming:) Hope you’re doing OK! Thanks for sharing and I’m glad to hear that your energy has returned. I’m really doing surprisingly well after stepping off that “is it?” or “isn’t it back?” roller coaster ride. I think finding that paper that said there were 53 different definitions of recurrence really helped me come to terms with everything. It’s pretty simple: PSA is there when it shouldn’t be. Period. It will be interesting to see what the doctor has to say when I see him next.